In this post I would like to share some links to those things to help you be able to go back and listen to podcast episodes and find the new posts (and old!) containing this information. In this podcast episode, I get my five tops tips for efficiency in the kitchen including using the crockpot (even for all kinds of meats, such as ground beef and shredded chicken), having ten meals that you always have ingredients on hand for, making combination meals whenever possible, and putting something – even if it is just a casserole or two – in the freezer each week. In this podcast episode, I present you with ten questions to ask yourself before you begin freezer cooking. These questions will help you determine what kind freezer cook you are and which methods, types of dishes, containers, and more will help you the most. If you have questions about state in which to freeze something, freezing entire casseroles versus just parts of meals, and what to put your freezer entrées in, this episode will help you. In this podcast episode, I explain how I do cycle cooking with various types of meat. If you truly want to be efficient in putting things in your freezer, this episode is for you. I describe the four types of cycles that I have: shredded chicken, crumbled brown beef, chicken breast and fish fillet, and shaped (roasts, swiss and smothered steaks, meatloaves, etc.). Then I give ideas under each cycle type so that you can see what you are already cooking and how you can start putting those in to freezer meals. This old blog post will at least get you thinking about some freezer meals that are important to growing families. These are some of my very favorites both for serving my family as well as for giving to others in need, using potlucks, and serving at parties, etc. I have been a mix user for twenty-four years – ever since I got the book Make a Mix Cookery. We all know how convenient store-bought cake mixes, Bisquick, bread mixes, brownie mixes, and seasoning blend are. Making homemade mixes allows the efficient cook to enjoy the ease of using mixes while controlling the ingredients. I have a few mixes and seasoning blends at the blog now, but please check back often as I’m adding my healthy cake mix, Healthy BakeQuick mix, and more. I have been working on a series of posts about helping your family learn to work fast. Check back with that series frequently because many of the tips that are there, such as kitchen blitzes, horizontal surface cleaning, and more will help you become more efficient in the kitchen as well. 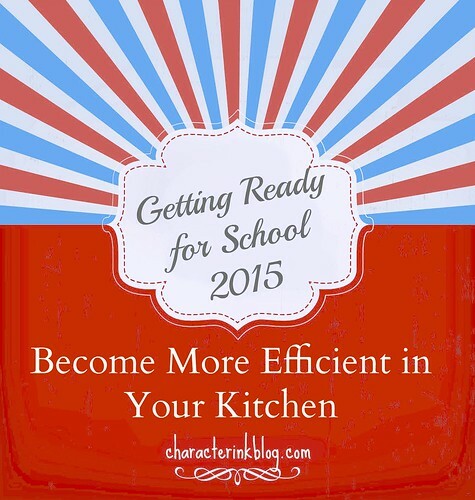 I hope these links will help you in your quest to become more efficient in the kitchen this summer. For me personally, in my thirty-one years of homeschooling, each time I added an efficient method or tip, it improved another area of our family, homeschool, and life.